FIFTEENTH DAY. --WE SHOULD BE IN THE STATE OF GRACE WHEN GAINING INDULGENCES FOR THE POOR SOULS. Holy Church teaches us that the state of grace is necessary to perform works that are merit-bearing for ourselves, and many saints and holy teachers of the science of God apply this same teaching to works and prayers which have indulgences attached to them and are to be applied to the Poor Souls. It is certain that if confession and Holy Communion are demanded for gaining the particular indulgence, the indulgence is not gained unless the person who performs these works is in God's favor at the time. A person who may be, unfortunately, in the state of mortal sin, can have Masses said for the faithful departed. He himself will acquire no merit thereby, but the suffering souls will derive the full benefit of the Holy Sacrifice. As we should always strive to be in the friendship and grace of God, if we have any doubt about our condition or are certain that we have lost God's favor then before trying to gain an indulgence let us confess our sins or at least strive to make an act of perfect contrition. Prayer: Grant us the grace, O Lord! To avoid sin at all times, and confirm in us Thy charity, that, by Thy bounty, our supplications for the suffering souls may be acceptable to Thee, and beneficial to them. Through Christ, our Lord. Amen. 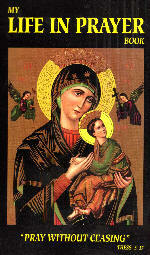 Special Intercession: Pray for the souls of those who were careful never to lose the grace of God. Practice: Make an act of perfect contrition.